Television used to be full of space skirmishes... that looked kind of bogus. And yet, they're totally beautiful and make our inner children giggle with excitement. Here's why we love the faux space battles. The 1990s were really the heydey for wonderful but not-quite-convincing space skirmishes. We used to see tons of ships flying around our screen, often too many to count. Unlike Battlestar Galactica's quick cuts and weird handheld camera footage, these 1990s space wars were usually filmed with an unflinching eye or a slow pan, letting you see every computer-generated line and explosion. You can compare these massive space shoot-outs to video games, but it's not entirely accurate — because the absolute best of these TV shoot-em-ups have more sensory overload, and you can't even imagine trying to interact with them. (I have seen a few video game cut scenes that approach this level of overload though.) You get ships flying in every possible direction, or a hundred individual starships on screen at once, and all you can do is sit there and drool. It doesn't look real, but your imagination fills in the gaps, which only makes it better. That's really the key — these space battles are super elaborate and over the top, and that helps them draw on your imagination. For people who grew up on space battles as shown on the original Trek, Space: 1999, Blake's 7 or even the first few seasons of Star Trek: The Next Generation, these dogfights are revelatory. If space battles in the late 1970s and 1980s were all about trying to match the dog-fighting feel of Star Wars, then 1990s space battles were all about massive fleets going at it, sustaining massive casualties and fighting on. 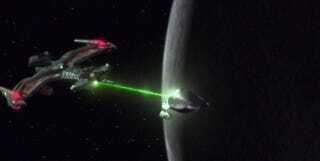 And yes, the massive casualties are a big part of why these battles rock so hard — you don't ever quite believe that each of those Federation starships has hundreds of crewmembers aboard, dying every time there's another flare on your screen, but it's still kind of horrifying and exciting to think so. It really is all about suspension of disbelief — these battles ask more suspension of disbelief from you, but they give more back as well. I suspect that we'll see a wave of nostalgia for these 1990s-style fleet-on-fleet battles, one of these days. Just like today, geeks feel nostalgic for guns that went "pew-pew-pew" and models roaring around fake starfields, in another decade everyone will be discovering the beauty of computer-generated space mayhem.